The plight of the folks in Sogi village is an humanitarian case and should conjure up questions of domestic and international consequence. After many generations, the Sogi villagers have been forced by the Samoa Land Corporation (owned by the Samoan government) to leave or face eviction from their homes. From the colonial times up to the present, the residents of Sogi village lived an existence subjected to insecurity and merciless threat. They lived on freehold land firstly alienated by the Germans and subsequently inherited by the NZ colonial administration, and the Samoan Government. This is a unique human experience in this country yet its correctness -or otherwise- must be judged by its own merits. The Government of Samoa is capable of doing just that. The story of the folks in Sogi village is about a race of people, facing old and new dynamics of human displacement due to circumstances beyond their control. They are socially dislocated, granted by their own desire in the beginning of their story, by wanting new opportunities overseas. 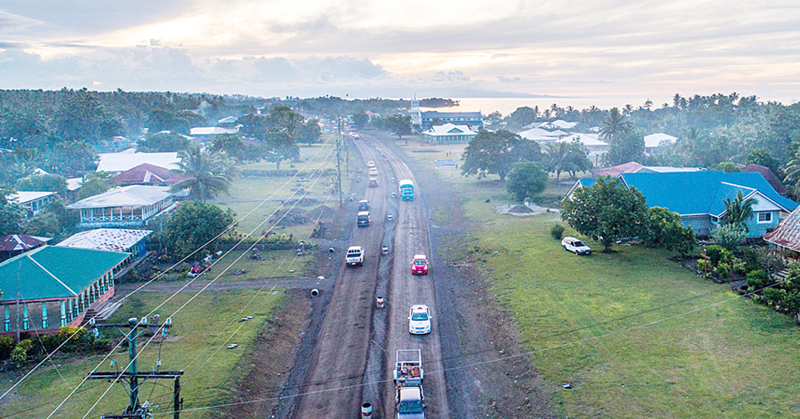 The opportunities presented themselves for green pasture away from home and the migration from the Solomon Islands and elsewhere in Melanesia to Western Samoa started in the early 1900's. They found work in the Samoan companies owned by German, and British colonial expatriates; and the New Zealand and the Western Samoa governments. All told, the ancestors of the present generation of Sogi villagers existed in conditions of neo-slavery. They toiled their lives away all in employment to advance the commercial interests of the Samoan nation. And they were poor because their wages were meagre but as human beings they were "rich" in Christian faith..
Sogi is not a" Mulifanua" nor a "Vaitele" where the out-reach of the " blackbirding" trade and the human trafficking trade made its mark. Sogi is original in every sense of the word, created by Melanesian and Polynesian identities. Before Sogi, the turf therein was a part of the Vaimoso village. So the present generation of Sogi residents rightly have emotional, psychological, cultural and spiritual attachment to the land, once the showcase of marine biodiversity in the virgin mangrove swamp. They call it home, their birth-place. They have as an ethnic group organised, accepted and practised a polity, considered unique to its survival in Samoa. The Matais, Pulenuu, and the Pastor formed the organised basis of its social order and governance. Sogi residents went on to contribute to our society as medical doctors, lawyers, top civil servants, medal-winning athletes in international sporting tournaments, pastors, business-men and so on. Sogi village is no different from the adventurous stories that led to the founding of many coastal villages in Samoa. The stories dated the Lapita- pottery- settlements in Mulifanua and Manono; and through the ages marked by Tongan, Fijian, and European invasion of our shores. The Sogi villagers came by boats many decades later like those Pacific Islanders. The notion that a genocide is happening at Sogi village is a moot point. Mind you, it might be a misguided point but certainly the massive displacement of Sogi villagers by socio-economic forces of urbanisation taking place is morally questionable. An example of massive displacement of peoples both internally and externally due to wars and economic decisions are happening in Europe. The member states of the United Nations including Great Britain, Germany, New Zealand and Samoa have signed or ratified International Treaties on the questions against " massive displacement of people", " Racism"," Discrimination" and other human problems. Are racial overtones present in the profound workings in the turn of events in Sogi? Common knowledge attests to the racially-charged attitudes of Samoan and foreigners towards Sogi in this country. O le "meauli", a warped mentality, testify to a racist Samoan. And that fabric of racist thought runs through the historical experiences of the folks in Sogi village. Granted, the present government inherited the problems in Sogi; nevertheless, it is not too late to take another look at the humanitarian situation in this question. The Government of Samoa should gift the area of land involved in this dispute to the traditional residents of Sogi village. And, if you will, take into account the idealogical spiel attached to the comparison between the Berlin Wall and Sogi village in Gatoaitele Savea Sano Malifa's recent editorial. The wall at Sogi is of course a symbol of a troubled past which lingers on and tests our national conscience. It is the divide between concrete and nature. It is a shameful past full of controversial behaviour involving our Samoan ancestors and the colonial expatriates that speak to us for redemption. Then, it was the" international era" when Western Samoa was the colony of the Germans, the British and the New Zealanders. Finally, the international community should under the ageis of the U.N.D.P. extend appropriate/grant assistance to the people of Sogi village to protect them from the challenges presented by Climate Change. They are entitled to such protection. It is never too late to say sorry in a meaningful tangible manner to the folks at Sogi village.